At Bent Tree en Español, we say we are "a family for you." Guest author Dulce Leith tells the story of how she came to Bent Tree, what God has done in her life, and how she's experienced Bent Tree as a family for her. Years later, I received a random call from Nando’s wife, Isabell, telling me that they missed me in Bible study. I told her that I had never been to their church. So she came to visit Nicolas and I one day. I told her that I would visit her church because she visited me. And I think that God wanted to tell me something. I went to Bent Tree en Español that Sunday and, to my surprise, I realized they were the same ministers that had visited me years before when my baby died! It gave me great pleasure to see them again. When Nando started to preach, I looked all around and thought, “Who told him my problems? Who told the minister everything that I am going through?” Obviously, God knew what I needed to hear in my life. It was not a coincidence. Before, I thought I was a good person. I didn’t rob, or kill, or do harm to others. I didn’t owe money to anyone. I didn’t do drugs or take someone else’s boyfriend. I worked honorably and took care of my son. But when I was listening to Nando’s message at Bent Tree, I began to see all my faults and wow! I understood that I am a sinner and that God will not let sinners go to heaven without payment for their sin. I understood that Jesus paid that price for me. That same day I accepted Jesus in my heart and received his wonderful forgiveness. The following Monday, I lost my job. The next day, I received news from the doctor that my son has special needs. On Thursday of the same week, the doctor told me that I have diabetes. I thought, “You know, Devil, you are just trying to get me to turn away from God.” But I kept going to church. I didn’t know these bad things were going to happen to me, but God knew it and got me to come to Bent Tree just in time! He sent me to a place where I am not alone, where I have found support and love, where there are free classes for parents with children that have special needs, where I can cry as I tell about my struggles and others tell theirs. I have found a true family who would accept me and my son. Although I had almost perfect vision before, because of my diabetes, I lost almost all of it. One day during a Sunday service, I looked at Nando through my glasses and everything was blurry. So, I said to myself, “No, please.” I took my glasses off to clean them, and then I looked at Nando and realized that I saw him perfectly without the glasses! God healed me! Before, I thought I had everything organized in my life: my finances, my studies, a career, I speak English, etc. I thought I did not need anyone because everything was under control. But God taught me that I should trust only in him and not in myself. 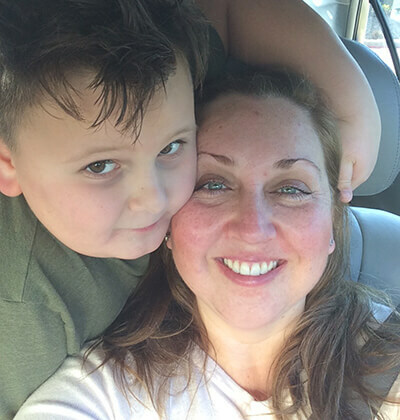 I almost lost everything where I was living: my health, my son’s health. But Nando told me to only trust in God. I am changed. I know that I want to live for Jesus alone. Now, I thank him every day; I am a blessing with feet on this earth. I receive blessing upon blessing every day. I am more surprised by my God in such small things, in those details that are only in my mind or heart. I am very spoiled. I thank God for Augustine and Mariana, who asked Nando to visit me seven years ago. I give thanks for Nando and Isabell for what they did. And I bless you and I thank you for belonging to Bent Tree. They really are a family for you.